Hello kids. Today we are going to touch on the funner points of analytics. Not finer points, funner points. Yes there are some. I don't think I even uttered the word "analytics" before the web. In fact, it's not in my dictionary as a noun. It sounds pretty nerdy, like something the math/computing/biology/pollster guys would worry about, not me. I'm a creative, why would I want to analyze data? Sounds dry. Raise your hand if you think that I actually look forward to launching Google Analytics and checking on the websites I manage. Those of you with your hands down are wrong, sorry. If you never thought "fun" and "analytics" would be in the same sentence, think again. 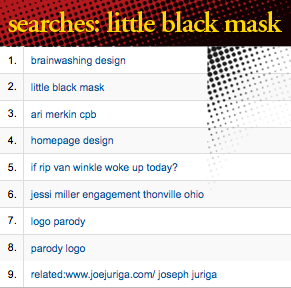 Take my website, littleblackmask.com, for example. Hmm, I wonder what people are typing in to find me. Can you guess? How about "brainwashing design"? You didn't predict that? Okay, try "if Rip Van Winkle woke up today?" No? I didn't either. Okay boys and girls, let's look at another example. 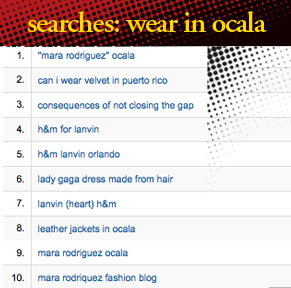 I design and manage Mara Rodriguez's blog, Wear in Ocala. It's an up and coming blog about fashion in Ocala, with some great advice and a spicy sense of humor. What would you guess people would have been typing in when they find it? Maybe, "can I wear velvet in puerto rico"? You didn't guess that either? What about, "lady gaga dress made from hair"? I never would have called that one. Meat, maybe, but hair? What can we learn from this? I'd love to say we have learned that staying on current topics is a good idea. As you can see from some of the other searches, there are some current event/famous people/on-trend searches. If your blog has content that applies, you'll be found more often. What about the others, though? How could you predict someone wants to know if they can wear velvet in Puerto Rico? You can't, but it's definitely fun to see! Never before on earth have we gotten such a peek into people's minds. This data is truly golden. Alright. That's it for today's peek at analytics. As you can see kids, they can be fun! Kind of like a box of chocolates, if you know what I mean.